The optimum goal of gastric bypass surgery for an obese patient is to achieve a significant weight loss. However, some patients may not attain the desired weight reduction or may regain weight after an initial weight loss. For this group of patients, a gastric bypass revision surgery may be the solution. These revisions are however not without complications. Failure after bariatric surgery is defined as achieving or maintaining less than 50% of excess weight loss (EWL) over 18 to 24 months or a body mass index (BMI) of greater than 35. The failure rate of LRYGB has been reported to be ∼15% with a long-term failure rate of 20–35% and a revision rate of 4.5% (Elnahas, Jackson, & Hong, 2014). The most common indication for gastric bypass revision surgery was weight regain or insufficient weight loss (Park, Song, & Kim, 2014). However, before embarking on gastric bypass revision surgery, it is important to exclude other causes of weight gain/inadequate weight loss such as non-adherence to a dietary plan, lack of exercise, and widening of the stoma. with or without endoluminal techniques, laparoscopic sleeve gastrectomy, laparoscopic distal Roux-en-Y gastric bypass (LDRYGB), and laparoscopic biliopancreatic diversion with duodenal switch (LBPDDS) (Park, Song, & Kim, 2014). Interested in undergoing Revisional Gastric Bypass Surgery in Tijuana or Cancun? Get our Board-Certified Surgeon’s Recommendations for Your Particular Case. The addition of adjustable silicone gastric banding (ASGB) to Roux-en-Y gastric bypass (RYGBP) may be a useful revision strategy because it has potential safety benefits over other revision approaches (Bessler, Daud, DiGiorgi, Olivero-Rivera, & Davis, 2005). This procedure provides additional reinforcement that helps regulate the pouch size, thus, reducing hunger and inducing satiety. Following this procedure, the EWL can be as high as 47% at two years (Park, Song, & Kim, 2014). This technique has also been reported to help with further weight loss and improve symptoms due to poor pouch emptying. In this procedure, the dilated gastric pouch is transected above the anastomosis, creating a new pouch volume of about 15 ml. A new anastomosis is formed using a circular stapler (Elnahas, Jackson, & Hong, 2014). 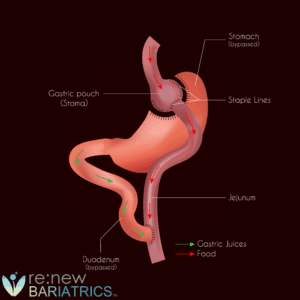 Following the failure of LRYGB, conversion to sleeve gastrectomy may be an option especially when the failure is associated with nutritional deficiencies. It can also be used as first step surgery for a patient that will undergo laparoscopic biliopancreatic diversion with duodenal switch (LBPDDS) to allow the patient lose considerable weight before the LBPDDS procedure. Reduction to an LDRYGB has been the most common revision for inadequate weight loss after LRYGB. However, this type of reconstruction can be associated with significant adverse nutritional sequelae. The procedure allows patients to lose more weight but at the expense of a higher risk for protein malnutrition and significant diarrhea. Therefore, patients who undergo revisional LDRYGB require more frequent monitoring and nutritional supplementation (Elnahas, Jackson, & Hong, 2014). LBPDDS appears to be the most effective bariatric operation to date, producing the most sustained weight loss without the unwanted side effects seen in other bariatric operations (Elnahas, Jackson, & Hong, 2014). The procedure is, however, technically complicated. The EWL after this surgery can be as high as 63% at 11months post-surgery (Parikh, Pomp, & Gagner, 2007). Some endoscopic techniques have also been employed to revise pouches (Elnahas, Jackson, & Hong, 2014). A circumferential injection of sclerosant (1 mL of 5% correlate sodium) into the site of gastrojejunostomy was performed by Spaulding to reduce the size of the stoma. The procedure was 100% successful, and about 75% of the patients experience weight loss. However, the average EWL at 6months was just 9% (Spaulding, 2003). The procedure has the risk of chemical esophagitis, stricture, or fatal hemorrhage if injected into the aorta (Elnahas, Jackson, & Hong, 2014). Interested in undergoing Revisional Gastric Bypass Surgery with Renew Bariatrics? Get our Doctors Recommendations for Your Particular Case for Free. Apply Now!